Medical Aid for Protesters Injured on June 30th! Rose City Antifa is calling for donations to support anti-fascist protesters injured during the events of June 30th! Protesters took the streets this Saturday to #defendPDX against the incursion of violent white nationalists led by Patriot Prayer. The far-right rally drew Proud Boys, white supremacists, and so-called patriots from across the country with the stated intention to attack local activists. Numerous injuries were sustained as anti-fascists valiantly stood against the far right to stop their hate-fueled rampage through Portland. 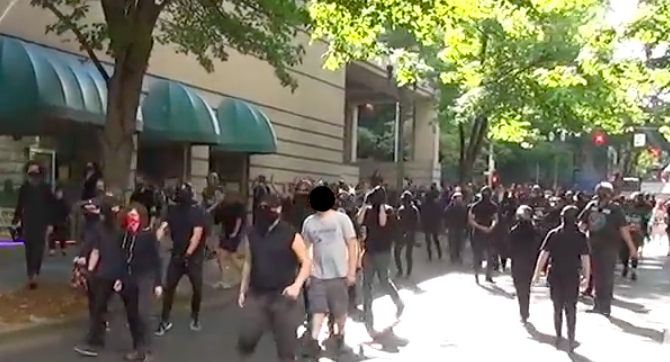 Attendees of the Patriot Prayer rally assaulted protesters with fists and improvised weapons while subjecting them to racist, homophobic, transphobic, and dehumanizing hate speech. Local and federal police simultaneously attacked the protest, firing “less-lethal” and chemical munitions into the crowd. For many, the heroic act of defending our community against organized racism has resulted in steep medical fees. For working-class protesters and those without medical insurance, these fees can be debilitating and expose them to further harm and precarity. We ask that the community stand in solidarity with those injured and traumatized on June 30th. Together, our donations can defray the cost of standing up against hate for our friends and neighbors. If you have medical expenses resulting from the events of June 30th and need assistance, please email Rose City Antifa at [email protected].